I'm not going to go into politics here. There is enough written politically right now & he is in office, so I won't say much. I will say I supported Barack Obama from the beginning. I worked hard to get him in office, because I believe him. That's it - I believe him. He appears earnest, genuine, and comfortable - that puts me at ease. I believe in his vision for America. Hard work this man has asked for himself. I strongly believe if he can't do it, no one can. He shook my hand. In little old Marion Indiana. In our High School Gym. No other candidate did that. To me, that speaks volumes. This giveaway is for a super little bundle of President Obama products. I will draw two winners. There are three shops I am going to feature. 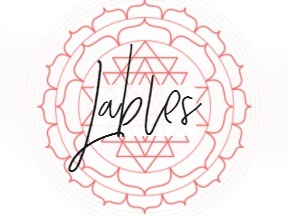 They have been so kind to me that I want to expose their work to all of you - I want you to remember them if you ever need goods like they sell. Bookmark them for latter if you like what they do. First is BLACKBIRD LETTERPRESS. I can't tell you just how amazing her work is. She was so easy & pleasant to work with. When her package arrived here in the mail, I was in awe & even framed her business card - it was that lovely. Next is OBAMABAGS. This company is so cool. You see I have all kinds of campaign products & I have never seen bags like this. When talking on the phone to the owner, I learned that the fabric used to make the bags comes from Kenya & was made by locals in their support of the then candidate. His grandmother lives in Kenya - what a great tie in. Last, but not least is OUTSIDE OF THE BOX. A fellow Hoosier and close by as a matter of fact leaves me feeling really good about working with this shop. I mean how can it not be good if it's from Indiana, we even voted the right way this time!! She was so generous - I couldn't believe all the shirts she sent. I have been wearing a cute pink & brown one and my 5 year old even has an Obama shirt now. Each bundle includes a mini tote from obamabags.com like pictured above , a notebook with Obama's likeness from Blackbird Letterpress, and a tee shirt from Outside Of the Box. Plus I'll throw in some campaign materials for historical keepsakes. For this giveaway, since there are three shops, I will ask that you visit each link - come back here & tell me another product in each shop that you like. I will give 5 entries for that step - you MUST do that step to enter. You will put that entry into ONE post. I will count it 5 times. 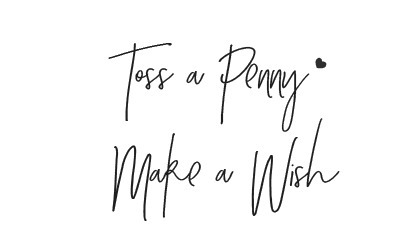 BE SURE TO ENTER MY TWIST GIVEAWAY BELOW!! 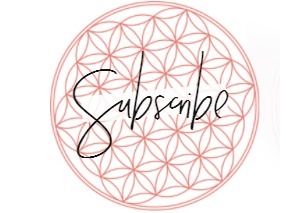 * Add my button to your blog :)) yay I finally have a button!! Blackbird Letterpress: Love the library lady letterpress card, reminds me of my grandmother who loved the library. ObamaBags: I like the Sarong / Table Throw (Grey), wish I'd have seen that before I had my inauguration party. Would have been perfect for the food table. Outside of the Box: Love the "Element of Change" tee; my son is a chemistry student and would love that shirt. I really like Obama's sense of family and his sense of humor. He seems like a good dad and I love that he promised his girls a puppy. Blackbird- i also LOVE the library lady cards. i love that kind of drawn line illustration. i love the fact that we have pictures of the President of our Unites States making and throwing snowballs!!! The other thing I like about Obama is that his girls seem to be well adjusted and well disciplined. They look well loved and taken care of. I think children are a reflection on the parents and judging by the girls, they are great parents. 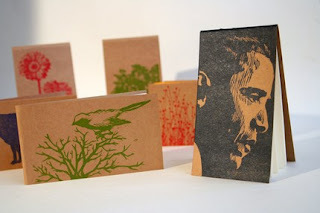 And the Obama Letterpress Moleskine. What I like about the Obamas is their sense of family. The love and admiration they all have for one another is remarkable. It's great to hear President Obama proclaim his love and all for First Lady Michelle Obama. Blackbird letterpress: Birds on a wire letterpress Moleskine cahier. ObamaBags: I like the Red Shopper Bag. If I had that in the supermarket for sure people would be taking a second look! Outside of the Box: Element Of Change shirt! I'm a Chemistry grad and this would be so cool! I love that Barack and Michelle aren't shy showing affection in public. It's mighty refreshing. blackbird letterpress ~ her work is so beautiful! I adore the carnival cards and also the peace cards, being the peace lover that I am I would totally send those out on holidays. obamabags ~ the grey sarong/table throw! I like the subtle colors paired with Obama's repeated face. oustide the box ~ the "i need change" onesie - cute pun! Nonpolitically, I admire the strong sense of family they project. Their girls seem very well adjusted, considering everything. plus they're adorable! lovely giveaway, is this open to international? Such great shops!! I love them all! Starting off, my favorite item from Outside of the Box is the Pink and Brown Element of Change shirt. Love it! Moving on to the Obamabags, I'm really digging the shoulder bag. It would be perfect for everything! Finally, from Blackbird Letterpress, you had me at Library Lady Card. See, I'm a library lady! Oh yes...anything to do with the library calls my name! I love the way he regards his wife. It's not in a "we're in public, fussy way". It's always personal, you can just see their love for each other. That is awesome to see! I like the "Element of Change" from Outside the box (too cute! ), The "Shopper Red" bag from ObamaBags, and the Gerber Daisy notecards from Blackbird Letterpress. I think something I admire about Obama (that's not political) is that he seems to be a really engaged father. I can't imagine how difficult that is with such a demanding job, but he does it well (IMO). Blackbird Letterpress: the ammonoid fossil card set. ObamaBags: I love the mini-totes. Very convenient. Outside of the Box: I love the Amniotic Aquatic Diveteam Veteran Onesie. Ha! I love that Obama is the parent of young children, and the way he models fatherhood in this country. I"m sorry, in my original comment I didn't mention a DIFFERENT product from Obamabags. I like the Shopper bag -- great for helping me eliminate the use of plastic bags at the grocery store! Obama's sister was a friend of mine in high school. I am thrilled that someone from Hawaii, who is used to being around peoples of all colors and creeds, is our leader. Who would have thought?! From Obamabags: the Blue/Choco style, just so enchanting, and it rolls up and ties for convenience, I want to carry my Obama books in it....with great joy! From Outside of the Box: The HOPE shirt in black and white is what I want to wear for summer strolls at outdoor markets and fairs...I am so proud of our President. I love the fossil coral cards at blackbird letterpress; I almost became a paleontologist so they speak to me. At Obama Bags I like the Sarong / Table Throw (Grey). What a great item for a campaign table! And finally, at Outside of the Box, I like the Amniotic Aquatic Diveteam Veteran onsie; it's too funny for words! I love the dignified and loving way President and Mrs. Obama are raising thir daughters to be strong young women. Awesome prizes! Thanks so much. Blackbird Letterpress: Susan B Anthony Letterpress. I like the fact that the Obamas seem fun, they smile, they dance, they joke around. They act HUMAN, something we haven't seen in the Whitehouse in a long time. Outside of the Box: Love the Element Of Change shirt! Okay, so I know the news is all over this... but I really do think that buff Michelle is an inspiration for all of us moms to get Healthy and Strong! Love it! I love birds items as decor. Obamabags: Shopper (Red). Reminds me of propaganda I saw while living in China. 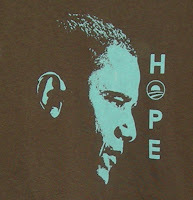 Outside the box: Obama courage to change shirt. I dig the Asian motif! I like that Obama is physically fit. Is that shallow? I love the Birds on a Wire Moleskine at Blackbird Letterpress! I am a moleskine junky! LOL! At Obamabags I love the MiniTote in grey. It is subtle, but makes the statement! Great bag! At Outside Of the Box I really like the black Element of Change Tee! Cute and smart! Love that! 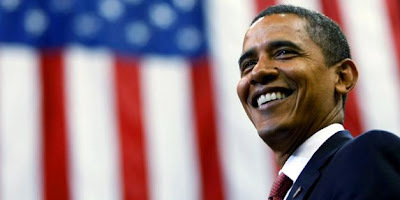 I just love the way Obama smiles! He looks really genuine! It's not a political thing, it's just a nice person kind of thing, you know? I am heading off to add your button to my blog! I need to get one of those! Oh pleasepleaseplease pick me, I would LOVE to win this prize!!! *I love the PEACOCK FEATHER CARD http://www.etsy.com/view_listing.php?listing_id=21942132 from Blackbird Letterpress. *The eco tote http://www.obamabags.com/products.php?p=5 from Obamabags. *The Obama Onesie Element Of Change Silver and Black http://www.etsy.com/view_listing.php?listing_id=18921799 from OutsideofTheBox. Like most commenters here, I love how Obama makes his family a priority. I also love how he takes care of himself physically, i.e. other than the smoking, he seems to work out regularly and eat right. He's trying to set a good example! I admire the amount of affectiong the Obama's display toward each other. It shows their love is genuine. Blackbird letterpress: I love the peacock feather card. Beautiful. Obamabags: Love them all, but especially the shoulder bag and the mini tote would be great for gifts. Obama onesie element of change would look so cute on my son! I love that Obama is a great dad, who is a feminist and really seems to respect women. BlackBird Letterpress: I love the Spirograph letterpress Moleskine. ObamaBags: I love the Shopper (Grey) bag. Outside of the Box: I love the J'aime Obama print shirt. The Obamas are family oriented and a people-person. Something that I admire about the Obama Family is that they're an actual REAL family, there's no faking it with them, you see them as people just like you and me, strong people and educated people trying to raise their girls to their best ability. I admire that a lot! I love the Blackbird LetterPress Spirograph. It's modern with a nice touch of handmade authenticity; just lovely! The Obama bags are really fun. Although I would like to go nutty for the eco-bags, I prefer the bold bag with the blast of color and our president's face featured clearly and alone. The "Element of Change" tee-shirt is adorable, catchy and modern. I dig that basics such as science and change are featured in such a novel way. Great job Jamaise, I'm really looking forward to more of your products selections and giveaways!! 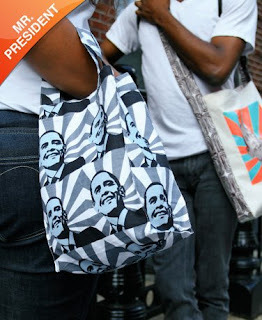 Obamabags: The Obama shopper is SWEET, although they are all pretty darn cool. OSoftheBox: the Elements of Change is a real winner. Thanks again. I'll spread the word, Tweet,FB,Blog,etc! Blackbird Letterpress: I think the peacock feather cards would make gorgeous birthday, thank you, or just saying hi cards. ObamaBags: I love the Shopper (Grey) because it looks just the right size to be used for any number of things. Outside of the Box: I would totally dress my 3-month-old in the Short sleeved onesie I Need A Change. The Obamas are just so... normal. Which is great. They seem like such an intelligent, warm, loving family that it makes me proud to know that they are the role models for this country.